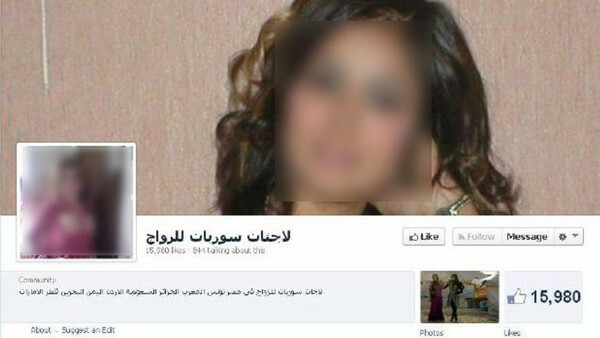 Syrian women refugees are up for sale on a Facebook page, and all it takes is a few thousand euros to buy one, according to Arab media. The page “Syrians up for marriage,” received more than 18, 000 likes in less than a week since its May 16 launch, but has since been taken down, according to Al Hayat. Human rights groups contested the page displaying pictures of potential Syrian brides, along with a description of their chastity and ability to perform household chores. “Across the Arab world, of all ages and religions – share this page!” the page said, according to a Lebanese news site. To inquire, men could send an email to initiate a transaction, according to the Kafa group, which has worked to condemn the site since its launch. Potential buyers are mostly from Saudi Arabia, Qatar, the United Arab Emirates, Tunisia, Morocco, Egypt, Algeria, Yemen and Bahrain. The Syrian humanitarian crisis has created a significant refugee problem pouring out into neighboring countries Jordan, Lebanon, Turkey and Iraq. There are at least 2.7 million registered Syrian refugees, according to the United Nations, with more than 1 million in Lebanon alone. Experts say the total number is significantly higher. While it appears the women on this Facebook page had voluntarily put themselves up for sale, there have been previous reports that Syrian women refugees are being exploited. Some of these women are as young as 12 years old. After the page was shut down, another similar one was created under a different name along with a cover photo showing a Koranic verse, implying that these marriages were acceptable by Islam. Obama will be taking the proceeds from the rescue of the Bokeh Haram girls.. Selling on facebook its not a good but necessitous women and girls should offer them self as marry. there are many good Muslims in the world who can accept them as bride and may be they could support their family too. i am one of them if any Syrian girl want to marry with foreign i am here i am ready to pick her as my life partner. may be i could support her family too. I can help a Syrian bride to the Pacific and God willing her family also. Hi there friends, good paragraph and pleasant arguments commented here, I am truly enjoying by these. Looking for someone to married its not a good but necessitous women and girls should offer them self as marry. there are many good Muslims in the world who can accept them as bride and may be they could support their family too. i am one of them if any Syrian girl want to marry with foreign i am here i am ready to pick her as my life partner. may be i could support her family too.My name’s Soni Im from Jakarta Indonesia, I have good job ,Single and ready for married and for help widow or girl are never mind . 00966503881548 this is my no then contact to me.I am from India but working in madina city as a operator if anyone syrian woman widow or girl want then contact me for marriage.I promise to take all responsibility with Almighty ALLAH fear. Mohammad Arifur Rahman is my name .I am retired government officer of Bangladesh ,leaving in Dhaka.My no is 008801681483330 .I respect the Syrians heritage .I shall be happy to support and marry Syrian brides .